So, Huw from Financially Free by 40 had organised another FIRE Escape gathering, this time in Sheffield. I wasn’t able to attend the entire weekend so just dropped in on the Saturday. This was the 4th such meeting I’ve attended. The venue was Weaver’s Cottage, a superb detached, stone-built, Grade II listed property. It did look a bit stark on the outside but inside, it was beautifully refurbished with new, modern amenities. It was good to catch up with Huw, Lou, M, Martina and Richard again, but also great to meet nine new faces – James, Ed, Eva, Valerie, Anne, Cora, Helen, John and Organised Redhead (OR did attend the last FIRE Escape, but wasn’t there the day I turned up!). As with previous FIRE Escapes, it was a good mix of people, everyone at various stages of their lives and FI plans, from savvy millennials using enterprising ideas to make money, right through to folk who had already retired and were living off their investment income and those who are FI already who were happy to share ideas and advice. We talked about all kinds of stuff including investing (shares and investment trusts), health and fitness, buy to lets and shared ideas on how to generate money such as buying stuff to sell on eBay, making things to sell, Kindle publishing, P2P, investing in whisky – maybe not a good one for you, FiL! 😉 and matched betting. I have to say that after each gathering I’ve attended, I have ALWAYS come away with fresh ideas or end up learning about something which I want to research further – I learned some new stuff about matched betting (thanks M and James) and about investment trusts (thanks John). I was there for 6 hours which just flew by and I wish I could have stayed longer. Had it not been for the fact that I really dislike driving down the Snake Pass in the dark, I would have stayed later. As it was, when it started to rain as I was driving back, I was glad that I left when I did. Unfortunately, I don’t think I had the chance to chat to everyone properly but hopefully, I’ll get the opportunity next time. If you’ve never considered attending a FIRE Escape before, I would highly recommend these friendly and informal gatherings. I believe it’s Huw’s intention to continue to organise them and I for one am very grateful, as his efforts have enabled me to talk to people who understand what I’m trying to achieve and I love hearing about other people’s stories and plans for FI. Whilst it’s great to put faces to bloggers, it’s also great to meet people who do not have blogs but who have similar goals, so cheers Huw for organising these FIRE Escapes! PS – M, I forgot to grab one of your home brews before I left! Doh! I won £50 (2 x £25)! It’s my first win in 9 months. I can’t recall if I’ve mentioned this but some of my redundancy money has been used to purchase more premium bonds. These bonds are accounted for separately (in my spreadsheets) from the bonds in my Future Fund since they’re not part of my long-term plan. Anyway, until I’m gainfully employed again, as and when I need funds for my living expenses, I’ll be selling some of the bonds. Let’s hope I’ll have notched up a few more wins by then! Unlike Jim who treated himself with his winnings, I’ll be chucking mine into my ISA! This entry was posted in premium bonds, Travels, UK Gathering by weenie. Bookmark the permalink. Hi Weenie, congrats on your win with ERNIE! I’m a bit guilty I didn’t make the trip to Sheffield as it’s not too far for me. Maybe next time and respect to Huw for keeping it going. Anyway, I still dabble in Matched Betting – got both Sky 2nd placers at the weekend – and withdrew the winnings from Betfair to blow it on half a dozen nice riojas from Morrisons! Spend, spend, spend, that’s me. Cheers Jim – fingers crossed for more winnings for the both of us! Haha, enjoy your rioja! Thanks for doing a write up on the FIRE Escape, I had such a good time again and came away buzzing with fresh ideas. It was great to finally meet you! I’ve even been inspired to have another dabble at matched betting! 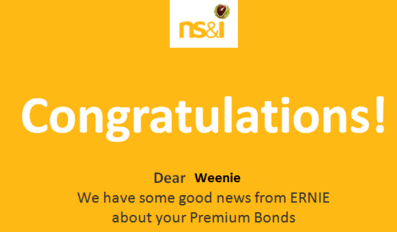 Congrats on the premium bond wins. It was great to meet you and I would have loved to have chatted more but ran out of time to ‘circulate’ as it were! Hopefully, there will be another chance to catch up. Good luck with the matched betting! Sounds like a great weekend, we were just too busy in Feb/start of March to even think about attending unfortunately. I will get to one this year come hell or highwater mark my words! It is great talking with people In Real Life, blogs are great to share ideas but you can get so much more in a short amount of time just chatting. Just got to remember all of the info to research later that’s the hard part! Well done to Huw yet again for organising it and long may they continue. Yep, meeting people face-to-face gives you so much more than what you get from just reading stuff online. I’d like to say that my own personality comes out in my blog but it’s possible that people who meet me might think I’m quite different in real life! Hopefully can catch up with you and Mrs T at some point again. Another (broad) subject that you might like to consider for discussion at your gatherings is the art of self sufficiency (i.e. ‘grow your own’). For those with an outdoor persona, plus the inclination and space, it can be a very rewarding way to put some food on the table and at the same time save some cash. It’s unlikely to generate any income mind, but as a small part of the overall FIRE strategy for me it makes perfect sense. As well as brewing beer and wine, growing your own food is something we’ve discussed in the past at previous FIRE Escapes. TheFireStarter grows/grew tomatoes and recommended some ‘fool proof’ plant pots. Huw’s missus Lou spoke about growing courgettes. I tried growing both tomatoes and courgettes last year but as I really don’t have green fingers, I got plants but no fruit! I’m determined though to give it another go! You can also invest in Fine Wine as well, but as with whisky and art this is not something I would personally recommend! Congratulations on your “big win” – as you say it’s somewhere to park your cash, the winnings are tax free then why not! Sounds like you already know quite a bit about investing in quality alcohol (that is, when you’re not drinking it ;-)). It’s good to hear that investing is not all about shares. Yes, let’s hope for more PB wins – good luck with yours too!